Scott Hornick, on bass, with the Jazz Ensemble. Dr. Trineice Robinson-Martin instructs Jazz Choir members on complex melodies. Other vocal instructors include Dr. Rochelle Ellis, far left, and Emily Gaggiano, standing. The piano accompanist is Jim Weber. Instructor Bob Kleinschmidt, left, with the horn section. 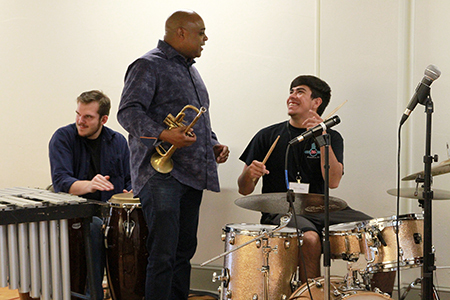 Guest artist Terell Stafford, of Temple University, shares knowledge and a laugh with a drummer. Trenton, N.J. – For one week this summer, Mercer County Community College’s (MCCC’s) Trenton Hall at the James Kerney Campus sounded like an intensive jazz jam session, filled with young musicians and singers sharpening their musical chops and absorbing techniques from professional performance artists. The results hit the high notes all around. 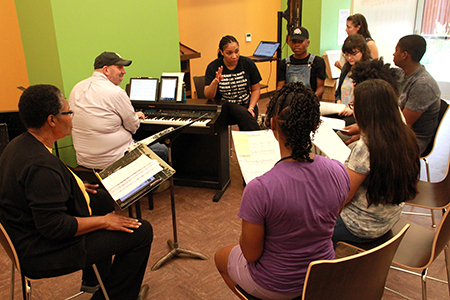 MCCC and Trenton Children’s Chorus teamed up to present a “Jazz Institute” master class for high school and college students from July 30 to Aug. 3. According to Scott Hornick, coordinator of MCCC’s Music program, 21 students participated in the week of music, including six MCCC students and 15 high schoolers. They concentrated in a range of areas: ear-training, jazz theory, improvisation fundamentals, practice methods and rhythmic studies. “There was a range of skill levels, but we found common ground to ensure that all students were able to grow. We saw their level of musicianship develop considerably across the board. These students now have the tools to take their music to the next level,” Hornick said. 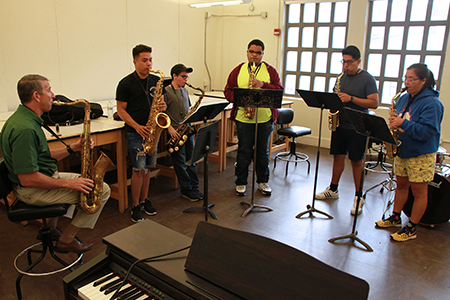 As students and instructors bonded over their shared passion for music, the instructors emphasized the importance of hard work and persistence. “Musicians need to hear it. They can’t give up if they want to be professional musicians,” Hornick said, adding that a press kit on how to represent oneself was also part of the curriculum. The week culminated in an outdoor concert on Aug. 3 for family and community members at the James Kerney Campus, with close to 50 people in attendance, including Trenton Mayor Reed Gusciora, who commented on how much he enjoyed the performance. “We successfully took students who had never improvised and worked on the fundamentals so that each student was able to take a solo at the concert,” Hornick said. Hornick adds that the students are looking forward to sharing what they learned with their school jazz bands when they return to their respective schools in September. “A few students commented that they grew more in one week than they could ever have imagined,” he said. In addition to Hornick, the Jazz Institute faculty included Dr. Trineice Robinson-Martin (Princeton University), Jim Holton (MCCC), Bob Kleinschmidt (MCCC), Dr. Rochelle Ellis, TCC Music Director and faculty member at Westminster Choir College, and guest artist Terell Stafford from Temple University. 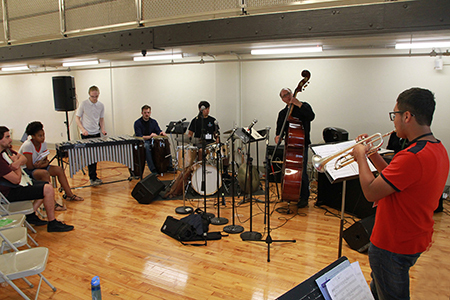 The Jazz Institute exceeded expectations for both students and instructors. “When you get a group of musicians together, good things happen,” Hornick said.